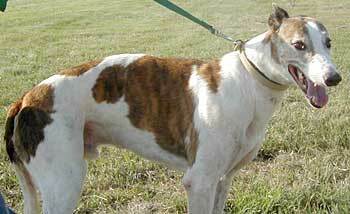 Jose, aka Ramons Snowonder, is a handsome 8-year-old white-and-brindle male born June 19, 1997. His sire is T Mcs Broker, making his grand sire Dutch Bahama, and his dam is Nitas Snowhite. Jose and Marilyn are siblings. 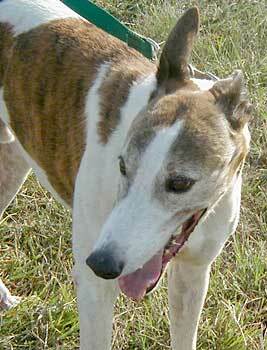 Joses racing career, according to Greyhound-Data.com, consists of 6 races, all at the Tampa track in Florida, starting July 2, 1999 and ending July 21, 1999. After meeting Jose, you will see why is racing career was so short - he is a gentle giant with an easy-going personality to match. Jose is cat and small animal tolerant.